Isn’t this just the prettiest bread? 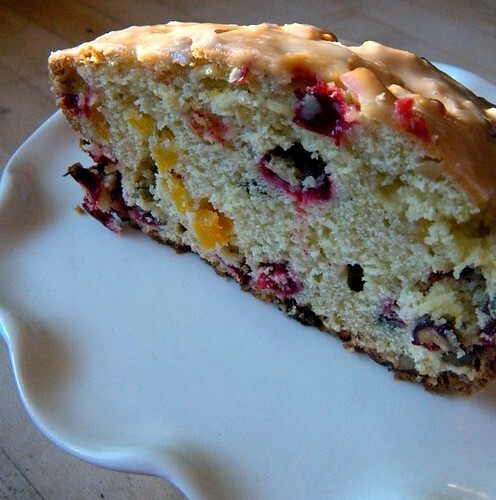 I love the sweet bread with the tart cranberries and apricots, and the nuts give a nice crunch. This bread is actually not too sweet, so if you like sweet sweet add a tad more sugar, or top it with a simple orange glaze. This bread would make a lovely hostess gift, but I like it just for snacking. Into a bowl sift together the flour, the baking powder, the baking soda, and the salt. In a large bowl with an electric mixer cream the butter with the sugar and beat in the zest and the eggs, 1 at a time. Beat in the orange juice and the milk and beat the mixture until it is combined well (it will appear curdled). Add the flour mixture and beat the batter until it is just combined. Stir in the apricots, the walnuts, and the cranberries, divide the batter among 5 buttered and floured loaf pans, each 5 3/4 by 3 1/4 by 2 inches, and bake the breads in the middle of a preheated 350°F. oven for 40 to 45 minutes, or until a tester comes out clean. Or bake in one larger loaf pan. Remove the breads from the pans and let them cool, right sides up, on a rack. The breads keep, wrapped well in plastic wrap and foil, chilled for 1 week or frozen for 1 month. If desired, pour one cup of powdered sugar in a small bowl and whisk in orange juice by the tablespoonful until thick/thin enough to coat the bread.